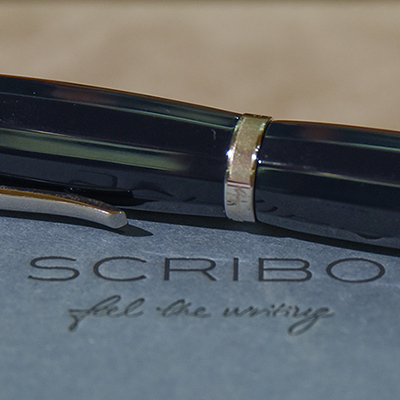 I had the opportunity to try out the new FEEL fountain pen by Scrittura Bolognese - Scribo. I got to say, I really enjoyed writing with the pen. 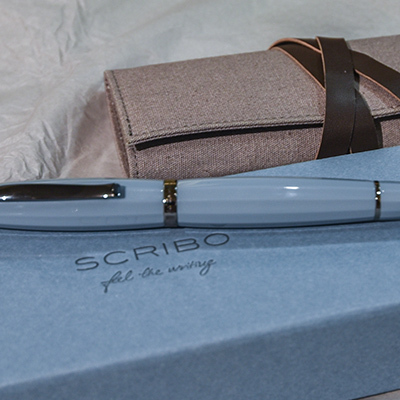 Scrittura Bolognese - Scribo, is a relatively new company. Started by former employers of OMAS. When OMAS closed, Scrittura Bolognese started. This is not their first fountain pen. They produced private line pens for stores and companies. In 2017 they issued Limited Edition pens and now, with FEEL, they are issues their regular production line of fountain pens. This pen the company refers to as its column on which to build its future. When I met CEO Luca Baglione he talked about the pens and the nibs. The nibs are are key of any fountain pen and here, FEEL has a real edge. Scribo bought the tooling used to make the OMAS nibs. The particular tools, at BOCK, the German nib produced, were used exclusively for OMAS. Now, they are used exclusively for SCRIBO. 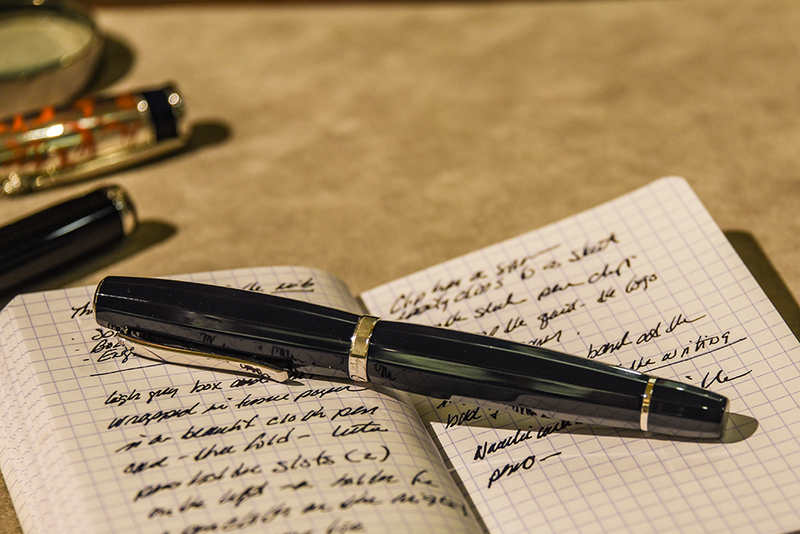 The OMAS flex nib has reputation for its high quality of writing experience. That is the nib with the FEEL pen. The name FEEL goes along with the by-line "feel the writing" speaks to the philosophy of the company and is certainly the experience with this pen with its quality. The pen comes in two nib styles: regular and flex. On the flex nib, a slightly different logo is used, and this logo says: Feel the flex. I did not think I was a flex fan. In fact, when Luca passed the pen to me I told him I typically don't write with a flex nib. I need a broader, firmer nib for my writing. But, one has to be polite and I tried it. Well, I was surprised. The pen itself is very attractive and sat very comfortably in my hand. The body is that of a Doric column. The pen is turned by hand from a solid bar of resin. The cap and barrel are not totally straight, there is a slight convex curve. Luca explained they choose that style as it is classic and timeless in design. It enhances the overall shape of the pen. Being a doric column, the body and cap are dodecagonal in shape, with twelve sides, however, the lower section of the body, the nib section, is made from the same material of the pen, and tapers to a circular shape. There is ever so slightly a feel of sides, but is very smooth and easy to hold. The pen clip is so stylish in its simplicity. There is no ball at the end of the clip, just a smooth solid piece of metal (rhodium plated). It goes very well with the overall look of the pen. The slight curve up at the end mean it smoothly clipped in my shirt pocket. The FEEL, feel the writing, well it is all about the nib. This pen has a great nib. I could have never expected to enjoy writing with a flex nib but it was so smooth, and and responsive to any pressure I applied. I expected to write a few words and put it down asking for the regular nib, but no, I just kept writing. 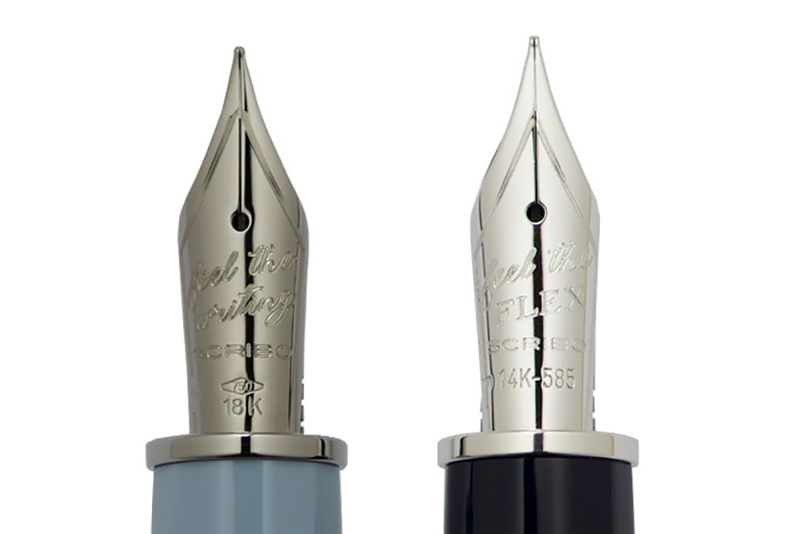 The nib of Feel, is available in 18-carat gold in Extra Fine, Fine, Medium and Broad widths. The second style is the 14-carat gold Flexible Nib also available in Extra Fine, Fine, Medium and Broad. Feeding the nib is an ebonite feeder which enhances the always the flow of ink to support always ready writing. The pen used a piston filling mechanism to load 1.42 ml of ink. I would compare that to my OMAS360 Vintage, which is a large pen, that holds 1.2 ml. 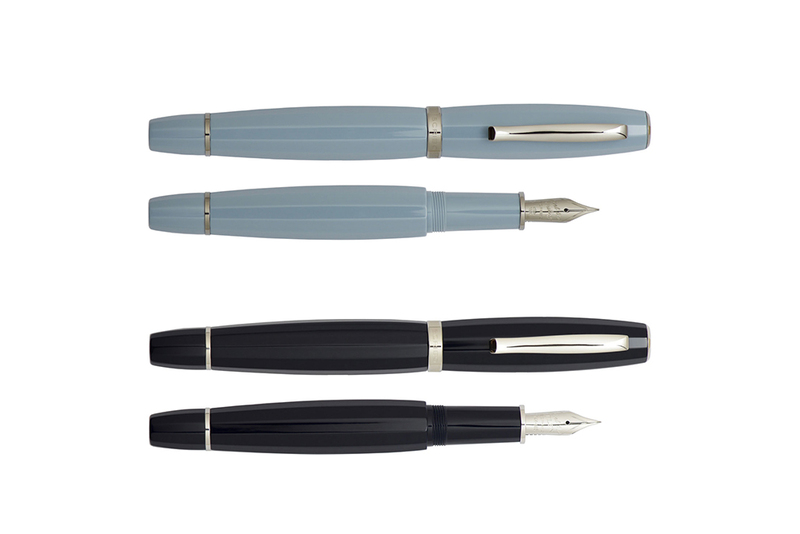 The FEEL pen comes in two colours: blue-black and grey-blue both with ruthenium trim. 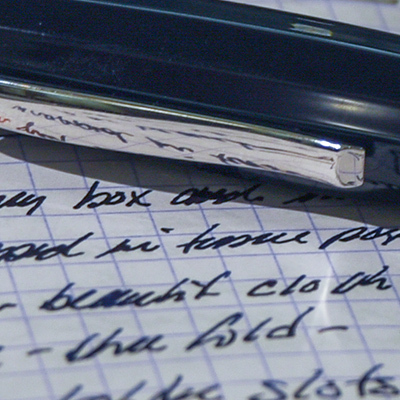 The blue black is the dark rich colour that OMAS used as at a glance looks black. The grey-blue is a colour that grows on you. It is not a mid or light grey but grey with blue. Interesting colour and the more I handled the pen I liked it. 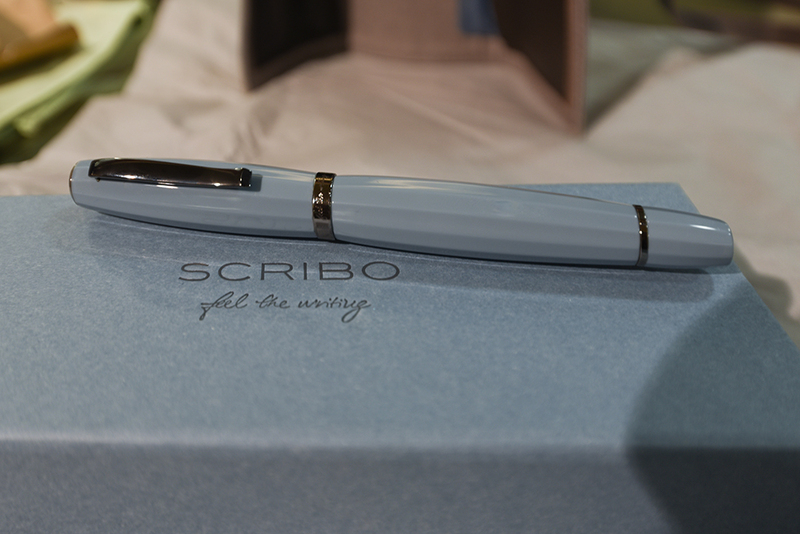 The blue-black comes with the regular 18-carat gold nib and the grey-blue comes with the 14-carat gold flex nib. The cap does not post on the end of the pen. Normally I always post my pens for overall length and protection from a pen rolling off my desk. In this case the length of the pen is sufficient enough that the pen is very comfortable without being posted. Thepen is 148 mm in length. That is basically the same length as the Pelikan M1000 (147 mm). The width of the barrel is 17 mm. The size is wider than the M1000 which is just over 14 mm. The fingers would be resting on the narrower nib section. So the width of the pen is how it sits in your hand, not how you have to hold it. There are twelve sides to the pen body and cap and that makes me feel very comfortable. No accidental movement of paper is going to see this pen just roll off the desk. The company has a passion about the use of pens to write. They have thought about many details of the pen right down to its box. 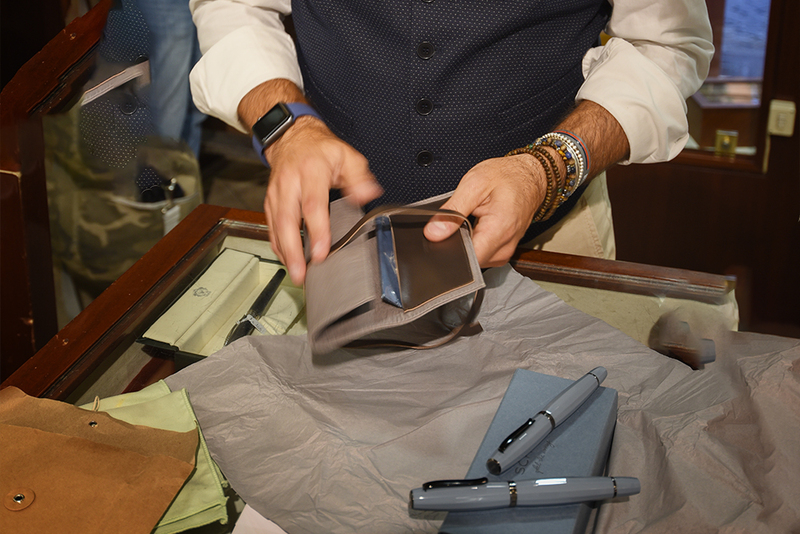 Rather than create an expensive box that may or may not be used after the pen is removed, the pen comes in a leather and cotton handmade soft pouch. Good planning. The pouch can hold two FEEL pens! 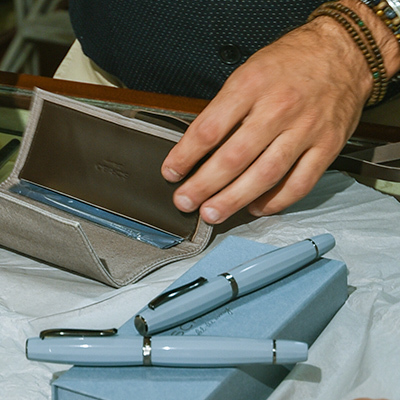 In the pouch there is a soft cloth that can be used to keep your pen clean. I think they made a very good call. The box has a limited use but the cotton and leather pouch, well that will be used every day. It is a great pen. 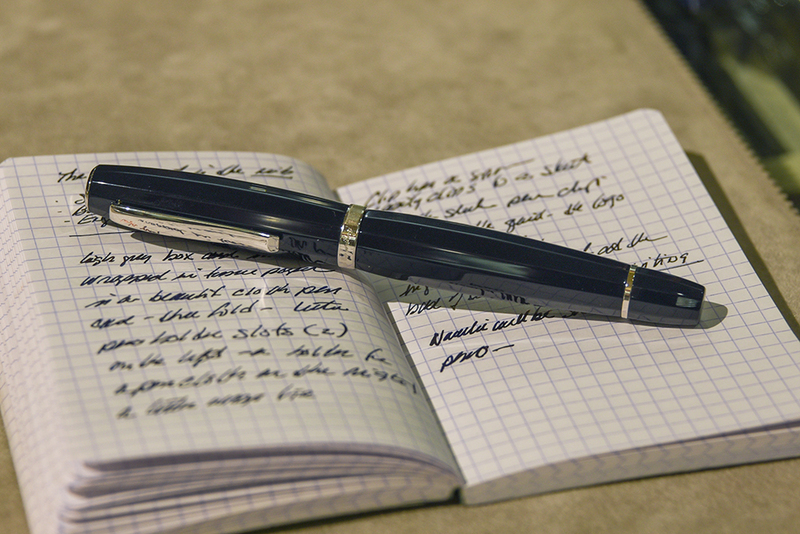 At 650 Euro the writer gets a fountain pen that is well styled and crafted. As I held this pen it was so smooth in my hand. The nib, well, I have as many, have valued the writing experience of an OMAS nib. 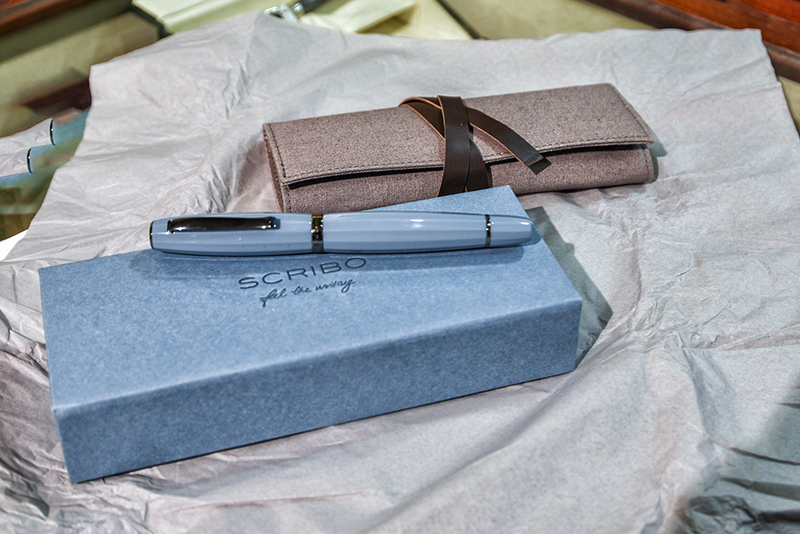 Here is a new line of pens that uses those nibs, the SCRIBO nib tooled with the same dedicated equipment. If you are interested in this pen, I know that Marco at Novelli pen in Rome will have them in stock as soon as they are available and he is taking orders now. The pens can be ordered from their web site. Trusted store, great service, fast shipping.